Helen Louise (Rahming) Bottomly died at age 94 on March 26, 2017 in Virginia Mason Hospital. She was born in Morristown, New Jersey on February 25,1923 to Emil and Louise (Daum) Rahming. She received a B.A. from the University of Montana in 1950. Helen enlisted in the Waves during World War II and was assigned as a Petty Officer to the Naval Air Station in Kingsville, Texas -- a primary training site for combat pilots. While there, she met and married Forbes Bottomly, a naval officer, on July 15, 1944. They had two children and three grandchildren. 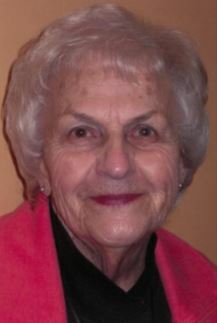 For many years, Helen was a middle school and junior high school teacher, holding teaching positions in Montana, New York City, California, Spokane and Seattle. She always did more than teach. In Montana, for example, while teaching in Browning (within the Blackfoot Indian Reservation), she also revamped and revitalized the school lunch program there and in Noxon. In addition to teaching, she found time to run a successful business in real estate and relocation sales. After Helen retired from teaching, she turned her attention full time to managing estates. She developed a passion for antiques and became skilled at valuing them. After moving to her new retirement community, she put those skills and her business acumen to good use at Seattle's Horizon House, where she is credited with transforming a small flea market into their "Monday Market" which brought in over $70,000 a year and funded most of the activities and programs of the Residents Council. Helen loved the study of antiques; she also loved travel (with Elderhostel and with her family), reading, music, and competitive bridge. Helen was a modern woman long before modern times. She knew how to get things done, and was never shy about taking charge. She leaves behind a legacy of accomplishment, and a family that loves her and will always miss her. She is survived by her daughter, Kim Bottomly of Boston, Massachusetts (son-in- law, Wayne), her son, William Bottomly of Seattle, Washington (daughter-in- law, Colleen), and three grandchildren, Hannah and Megan Janeway, and Daniel Bottomly. There was a celebration of Helen's life on Thursday, March 30 in the Horizon House Anderson Forum. In lieu of flowers, the family requests contributions to the Horizon House Partners in Caring Resident Assistant Fund.